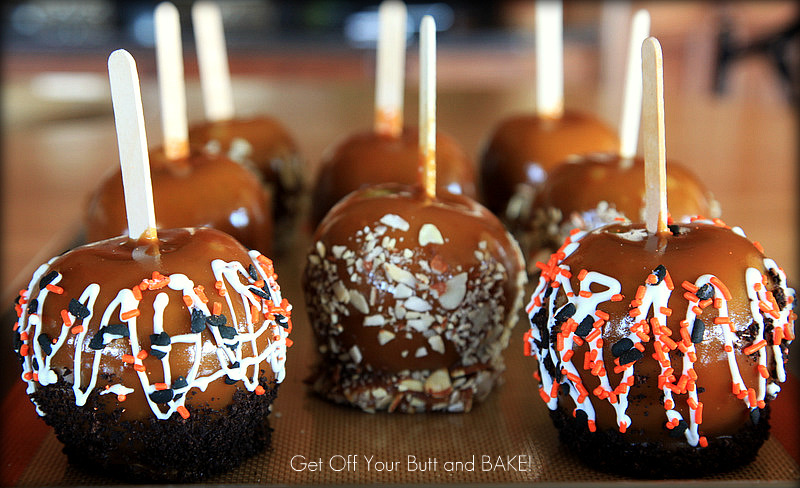 Don’t you think that fall screams Caramel Apples? I don’t make these often, because I can’t resist eating them. This caramel recipe is a long time family favorite. I promise you . . . Once you make homemade Caramel, you’ll never unwrap a store bought caramel again. To be honest, I’ve never dipped the bottom of a Caramel Apple in Crushed Oreos before. The picture in the Taste of Home Magazine called out my name though. They looked so Halloweeny! Caramel, Chocolate and Crushed Oreos . . . need I say more. 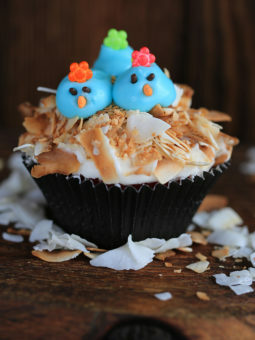 Chopped Almonds adorn the others, but most any nut and a myriad of sprinkles will also be tasty. If the truth be known, I prefer mine plain jane . . . with just caramel. I double the recipe, and then I can also make Caramel Popcorn. If you like chewy, gooey caramel popcorn . . . this is the recipe for you! It also make perfect popcorn balls. 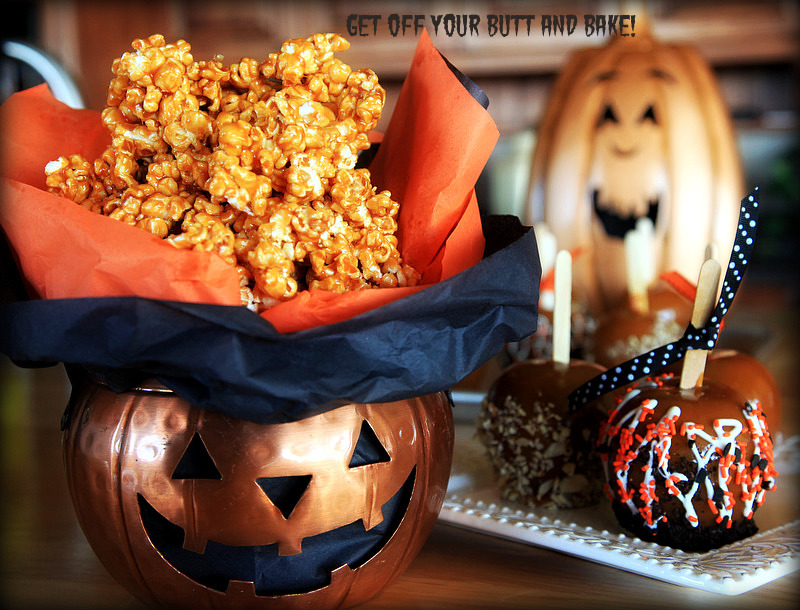 You can even use black paste color or orange and make scary popcorn balls. It’s fun to give away. That way you can’t eat it all by yourself. Line a cute pumpkin with Tissue Paper, then lay Parchment, wax or Saran wrap on top of the tissue paper. 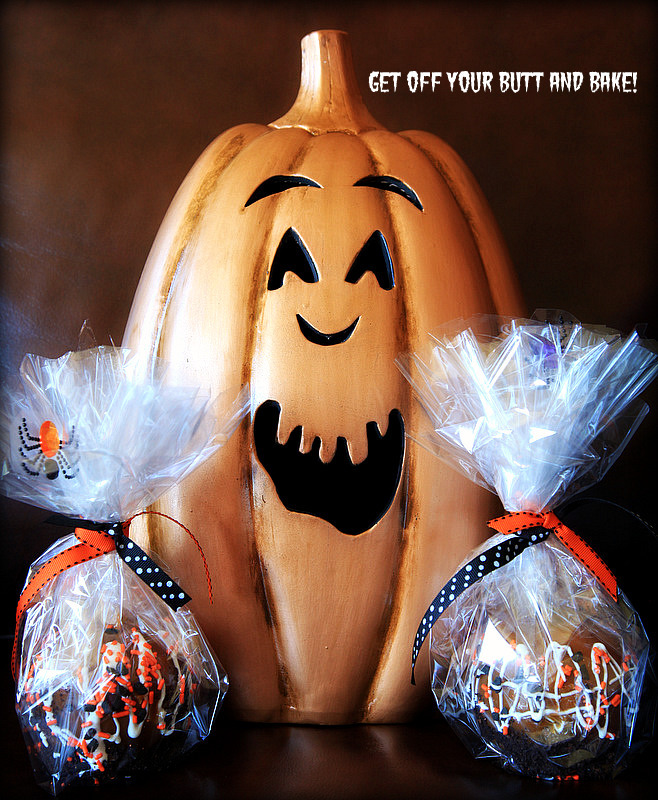 What neighbor wouldn’t love you knocking on their door with these goodies? If I’d been using my head, I would have used a golden yellow tissue paper . . . down by the face. 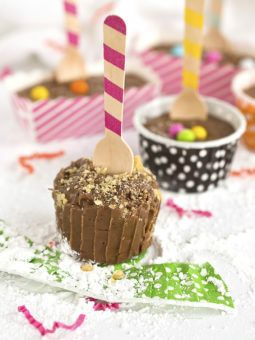 You can also wrap the Caramel Apples in Cellophane and tie with bright bows. Add a few spiders as well. I love these Copper Pumpkins . . . I found them at TJ Maxx. Wash and dry your apples, remove the stem. Insert the sticks. I like Granny Smith, because they stay very crisp and hard. Pink Lady also work well, and aren’t quite as tart. Do you see what the apples are resting on? It’s a Silpat. Nothing sticks! Oh . . . Let me just say . . . They are well worth the money. I found mine at Macy’s, and with a coupon they were very reasonable. No need for Parchment paper anymore! Let your apples be at room temperature when you dip them. The Caramel will adhere much better. Note: I always use Fat Free Sweetened Condensed Milk. Honestly . . . I really can’t tell much difference. Not that these are low calorie treats by any stretch of the word. You will want to combine all the ingredients except for the Condensed Milk and the Vanilla. Wait until the Caramel Mixture has come to a boil over Medium heat . . . FIRST! note: I always make sure that all the sugar grains are well dissolved before I add the condensed milk. Then . . . slowly stir in your condensed Milk. I’m using 2 cans, because I double the recipe. STIR . . . STIR . . . CONSTANTLY . . . or it will scorch on the bottom. Note: It’s very difficult to take a “shake free” picture with one hand, while pouring with the other! Therefore . . . the pic’s usually stink. Once you’ve added all the condensed Milk, place a candy thermometer in your pot. I very seldom use a Candy Thermometer unless I’m making Toffee or Peanut Brittle. I was trained by my momma to do the COLD WATER TEST . . . It works! While the caramel is cooking, you can quickly chop nuts, smash oreos, etc. DON’T FORGET TO STIR THOUGH! . . . Very important. Put your oreos in a Ziploc bag, and use a rolling pin. Lay out everything you need, because once you Dip the apples . . . You must dip and ROLL! I’ve found that wax paper will sometimes even stick. Let the Caramel drip off just a bit, before you roll the bottom and sides. Roll the apple in as little or as much as you like, then place on your lined cookie sheet. I wan’t to dress some of my apples for Trick or Treating! Sprinkles and melted Candy Melts. transfer that melted chocolate to a ziploc bag. *If you feel that your chocolate is a bit thicker than you like . . . add 1 tsp of vegetable oil, and stir to combine. You can add a touch more, but don’t thin the chocolate too much. Simply cut a tiny little tip from the corner of your bag, and pipe chocolate stripes around or down the apple. Before the chocolate hardens, add the sprinkles. Don’t roll the chocolate stripes in the sprinkles . . . simply shake them on, or you’ll mess up the chocolate! You could also dip your entire Caramel Apple in Chocolate. White or milk or Semi. Oh . . . very delicious! Wash and thoroughly dry apples; insert a wooden stick into each. Place on a silpat or parchment paper lined baking sheet; keep apples chilled while you make the caramel. Place cookie crumbs and chopped nuts in a shallow dish; set aside. In a heavy large saucepan, combine butter, salt, brown sugar, corn syrup; bring to a boil over medium heat. Slowly stir in the condensed Milk, and stir well. Keep stirring constantly over medium heat until mixture reaches almost a firm ball stage. I prefer about 230-235 degrees, so that the caramel isn’t too stiff. I also use the Cold Water Test. Drop a tablespoonful of hot caramel into about 1/2 cup of COLD WATER. Toss the caramel around in the water for a few seconds. If the caramel will come together in a nice ball, that won’t flatten after setting it on the counter….it’s ready. You don’t want it to flatten quickly, or be a hard rock. Just a nice round firm but soft ball. Remove the caramel from the heat; stir in the vanilla. Dip each apple into hot caramel mixture to completely coat, let excess drip off. Dip the bottom of apple into cookies crumbs or nuts if desired. Return to the baking sheet to cool. 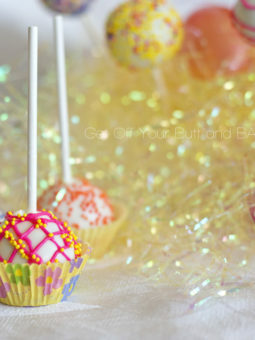 In a microwave, melt candy coating, at 30 second intervals until melted and smooth. Transfer melted chocolate to a small plastic bag; cut a very very small hole in a corner of the bag. Drizzle coating over the apples. Decorate with sprinkles. yield: a single recipe will make 8 -10 apples. Keep decorated apples in the refrigerator until ready to eat. This caramel recipe also makes delicious caramels that you can wrap with foil or Wax paper. Spray a 9×13 dish with a non stick spray or use butter, and pour caramel into dish. Cover with saran wrap and cool caramel in the fridge. I like to line my pan with parchment paper first, then I can easily lift the entire slab of caramel out of the pan and cut with a sharp knife. If you want nut caramels, simply stir chopped nuts into the caramel mixture that has reached the correct temperature and stir well. YAY! I can’t tell you how excited I am to see today’s post! I was looking for a homemade caramel apple recipe. 90% of the ones on the web call for unwrapping those dreadful caramel candies. 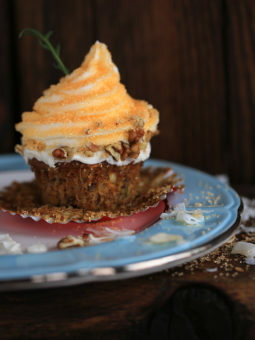 I’ll be making these super soon! Thanks, Jonna! It really depends on how much caramel you like on the popcorn. My hubbie prefers much less than I do. I put half the popcorn in a large bowl, and pour part of the caramel over….then stir. Add more popcorn & caramel in this manner, so that you get the right ratio for your taste. Hi, Jonna! I’m making your caramel apples on Sunday how long do they stay “fresh”? Okay, so I made 10 apples (all I had) and I have atleast 3 cups of caramel left over. (The caramel tastes insanely good!) My apples aren’t as nicely coated as yours, which is why I have so much caramel left over. I even dipped them all twice. Whaddaya think? I took the caramel off the heat at 231. Should I have cooked it longer (235)do you think? Thanks for sharing, Jonna! I got the copper pumpkins last year at TJ maxx. Love that place!